Sick Puppies released their third album Connect yesterday. This is one I’d been waiting for since I got my hands on “There’s No Going Back”, first single, and a harbinger of the greatness to come. Opener “Die To Save You” shows the band in trademark rocking form, with a nice tempo change on the chorus. Bassist Emma Anzai joins singer/guitarist Shimon Moore on the lead vocals about a minute and a half in, and it really adds to the song. “Walking Away” is another fast-paced number that comes crashing in hard on the refrains, drummer Mark Goodwin pounding away. The socio-political satire of “Gunfight” is one of the disc’s brightest moments, and no one is spared, not historical figures, entertainers, politicians, no one. They even manage to work in a reference to Tianenman Square. I found myself listening to it multiple times, each time catching something I missed before. “Poison” is a melancholy song about a bad relationship, something that’s been done to death, I know, but it still sounds good, especially when it turns angry for just a moment. “Where Did the Time Go” is one of several songs that have a Goo Goo Dolls vibe to them. The sound is broad, the choruses grand, and it shows a definite maturity in the band. That’s not to say past works were juvenile, because they certainly were not. It’s just something that’s immediately noticeable from the first listen. Another example is the atmospheric “Telling Lies”, this time with a call and response between Shimon and Emma on the hook over world music-type drum patterns. Two more great songs are the title track “Connect”, and “Run”. One features that summery, rapid-fire acoustic-strumming, bass drum as main timekeeper thing that makes you want to sit barefoot on your front porch with a beer or a cocktail. The other is made for a drive with the top down on the PCH, or a highway in the band’s native Australia, singing away. Things take a bizarre turn at the start of “The Trick the Devil Did” before it gets heavy. This is the last song of its kind, as the album ends with a pair of more acoustic songs. Again, I love the fact that Emma has more of a vocal presence on this record, because a song like “Healing Now” goes from a good song to a great song thanks to her. And she takes the reins completely for closer “Under a Very Black Sky”, which is hard to describe, and sounds unlike anything else on the album, but I found myself drawn to it over and over. 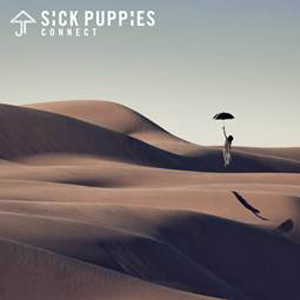 Sick Puppies seem to be growing with each release, and Connect looks to be a step in a nice direction. Enjoy!